Angel’s Rest, located in St. John (US Virgin Islands), is a bar that is as unique as they come. 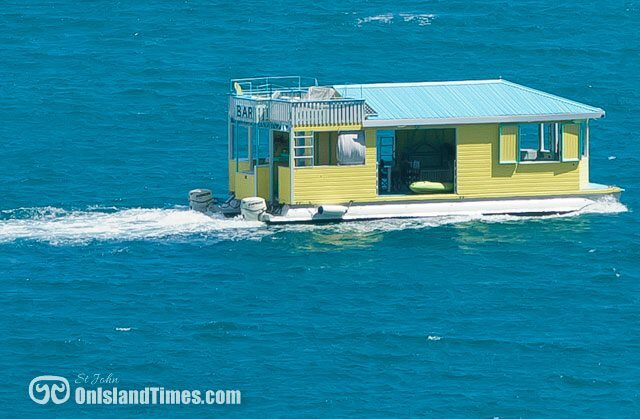 A 40 ft. bright yellow pontoon boat, Angel’s Rest is a floating alcohol dispensary, featuring a full service bar, seating on two levels (a second level sun deck! 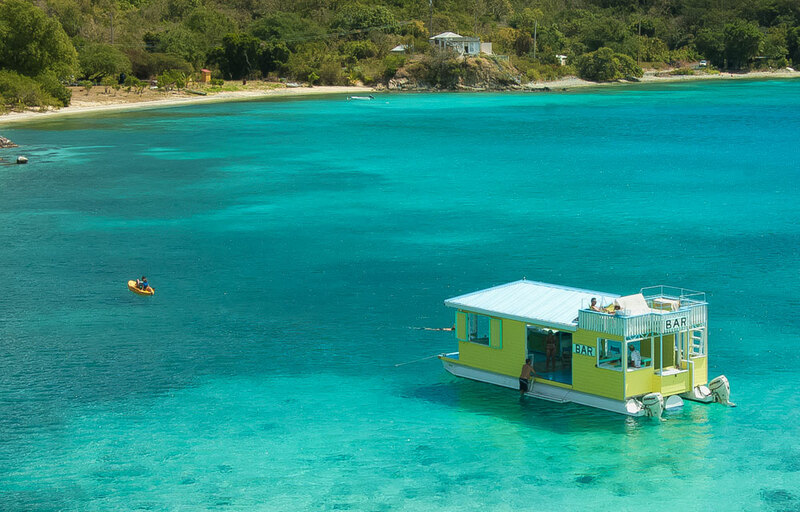 ), plenty of outdoor space (albeit in the water) for all of your friends and a hole in the floor for admiring the beautiful colors of Coral Bay. 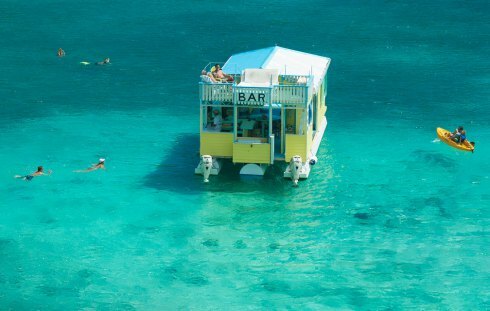 To be honest, the hole is probably used most often as a handy serving access for the adventurous bar patrons who hang out underneath the boat but sure, you can also view the pretty colors. Owned by and captained by Peter Hoschl, Angel’s Rest is often found anchored in the waters outside of Vie’s/Hansen Bay. It has no cover charge so don’t worry about your swim being in vain – you just have to get to it. Trepid swimmers have no fear – the boat will get as close as possible to the beach to shorten the length of your swim. No Olympian level skills are required. And for a last resort, dinghy pickup is offered. Want to make sure Angel’s Rest will be anchored nearby when you’re in the area? No worries, mate. You can check their Facebook page for daily updates or contact Captain John directly at 340-514-6270. Still not convinced? Drinking at Angel’s Rest may help you lose weight! If you figure in the amount of physical exertion required to swim out to it and back, you might actually lose a pound or two depending on what you drink. Multiply that over a week or two and BAM, you’re ten pounds lighter. Yeah, you can thank me later for that little nugget as you admire your newly toned physique in the mirror. Angel’s Rest is also available as a charter for day cruises around Coral Bay (gourmet meals included), custom cruises, sunset tours and cleaning if you want to get your hands dirty. Great article on our local floating bar, Angel’s Rest! Thx for the generous photo credits – and Angel’s Rest will certainly love the promotion! Thank you! Appreciate access to the photos. Always glad to try and help a small business out! back from now on. I want to encourage one to continue your great posts, have a nice afternoon! Is this still in existence? I have been to St John a few times and never seen it. Yes, it is. The Facebook page for St. John On-Island Times is the best place to keep track of it. You can find it here – https://www.facebook.com/St-John-On-Island-Times-397819033659385/. Cheers! Thanks for the comment, Richard! You might try reaching out to them via their Facebook page. Cheers!